We are pleased to share that Civic Solutions Pvt. 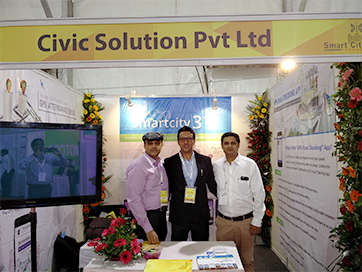 Ltd. had its booth at the Launch Event for Indore Smart City Project that held on 12th February 2016. Indore Municipal Corporation in association with CII had organized the event at Grand Hall, Brilliant Convention Center. The city of Indore cordially invited our company to showcase our solution SmartCity-311. The event inaugurated in the presence of Honorable Speaker Loksabha Smt. Sumitra Mahajan, Hon Urban Development Minister, Govt. of India Shri Venkaiah Naidu and Hon Chief Minister, MP Shri Shivraj Singh Chouhan and Honorable Mayor Indore, Smt. Malini Laxman Singh Gaud. At the event, our company got a huge and positive response from the visitors.